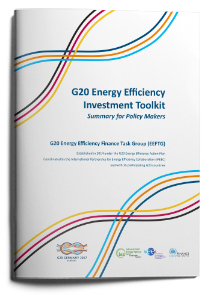 The G20 Energy Efficiency Investment Toolkit marks the culmination of three years of UNEP FI engagement with the G20. 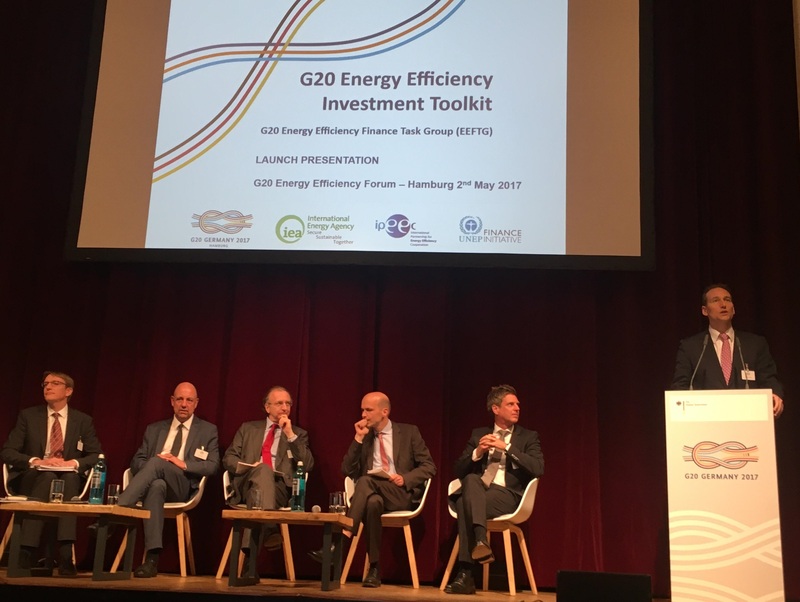 Public and private sector financial institutions are increasingly tackling the energy efficiency investment opportunity by sharing their approaches and tools for joint development, as showcased in the G20 Energy Efficiency Investment Toolkit. Annie Degen, UNEP FI Coordinator for Energy Efficiency, highlights the contributions from private financial institutions and public finance institutions captured in the Toolkit. UNEP FI led the development of the private finance section. UNEP FI surveyed banks to better understand their approaches to energy efficiency. Globally, 122 banks have now made visible their mobilisation, and the steps they have made towards integrating energy efficiency into mainstream bank financing, through their support to the Statement by Financial Institutions on Energy Efficiency. These banks start with a specific policy, strategy or target for the financing of energy efficiency. Nearly all banks indicated that energy efficiency finance has a strong business potential, and have identified drivers for financing growth. Real estate and consumer and corporate lending are where banks can be active on energy efficiency. Yet few take into account either energy savings into their credit analysis, or track the energy performance. On the investor side, the toolkit provides unique insights on how energy efficiency is integrated into investment practice, implicitly or directly, leveraging on the Principles for Responsible Investment’s reporting results, and CDP’s recent reports. Leading institutional investors representing over USD 4 trillion are signatories to the G20 Energy Efficiency Investor Statement, and have shared their understanding of the positive benefits of energy efficiency, and the need to fully embed it into their investment processes. Integrating the consideration of energy efficiency in company assessment, shareholder engagement, and the emergence of energy productivity tools are all good illustrations. Real estate is a sector of particular importance, where tools have been developed to assist investors. Efforts are required to support explicit measurement and reporting of energy efficiency as it is often embedded in broader themes. More work will be needed to increase the visibility of energy efficiency in investor strategies and company disclosures. Members of UNEP FI’s Principles for Sustainable Insurance (PSI) have been consulted as part of the process of preparing the Toolkit, and are enabling a better understanding of the opportunities for energy efficiency insurance and the role of insurers in scaling up G20 energy efficiency investment. Insurance products and services can help remove technical uncertainties, and allow banks and non-specialist investors to focus on credit, process and corporate risks. Insurers can help increase energy efficiency investments through improving the risk profiles of the underlying projects. The four Principles for Sustainable Insurance are a useful framework under which the insurance industry’s support for energy efficiency could be developed to upscale energy efficiency investments, and to encourage the insurance industry’s commitment to bring visibility to sector leaders and best practices. Public Financial Institutions can help leverage more private capital and support policy makers, and they have identified seven key pillars for joint development. From 2012-2014, six leading public financial institutions invested over USD 7 billion in “core” energy efficiency investments representing 14% of their energy portfolios and 3% of their total investment portfolios, an amount equal to around half their investments in renewable energy. Three of the key areas identified for joint development are: increasing direct financing support of policy frameworks; increasing technical and project development assistance facilities; increasing on-lending activities with retail distribution networks, and; ensuring energy efficiency’s central role in the future of mobility, smart cities, energy grids and infrastructure. Find out more, and download the G20 Energy Efficiency Investment Toolkit here.